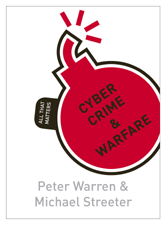 In Cyber Crime: All That Matters, Peter Warren and Michael Streeter outline the history, scale and importance of cyber crime. In particular they show how cyber crime, cyber espionage and cyber warfare now pose a major threat to society. 6 The rise of the botnets – the greatest threat to the online world?